We design and create our bridal collection in our Oregon studio with the TOBY POMEROY focus on grace, beauty and wearability. As with all of our jewelry, our bridal collections are sourced and created with a commitment to a sustainable future, utilizing eco-friendly materials including TRUEGOLD™, white and yellow gold or platinum, and certified conflict-free Canadian diamonds traceable to their source. We are proud to be one of the world’s first designers in the offering engagement and wedding rings created from responsibly mined and refined gold and platinum. We use TRUE GOLD™ gold and platinum as an expression of our commitment to offer precious metals that are the most pure available and are traceable to a particular responsible artisanal mining community. We support artisanal mining communities who are certified as Fairmined or are on the path to obtaining their Fairmined certification; communities that are third-party certified to meet the Fairmined mining standard, and are for mining gold and platinum without the use of toxic chemicals while caring for and restoring our environment. Here’s a quick overview of our bridal collection, individually created by hand in our Oregon studio. Graceful yet strong, the Adonis is a secure choice in center diamond engagement rings for those who live an active lifestyle. 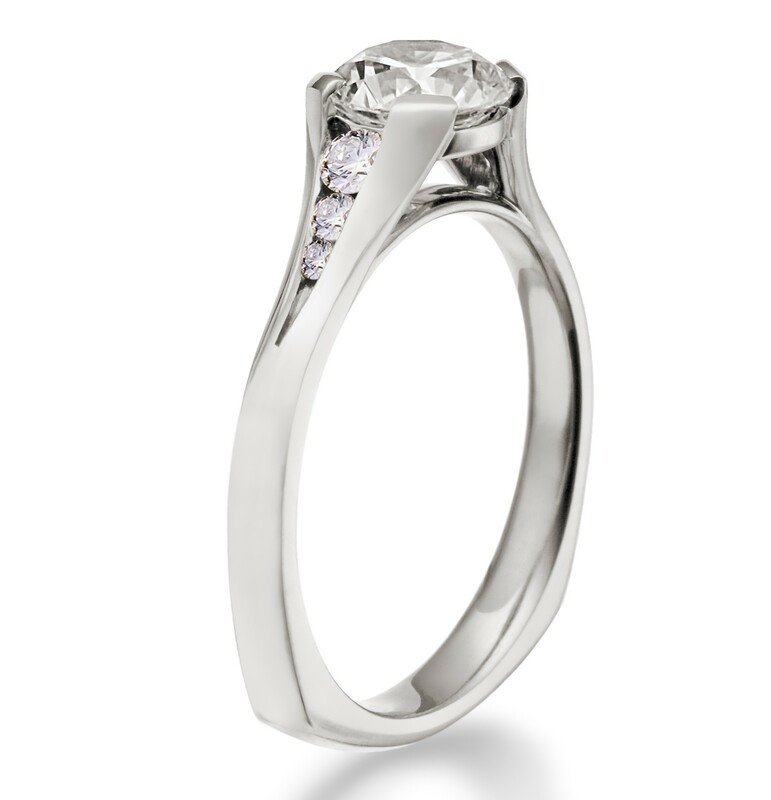 Designed to accommodate a one-half to a one carat+ center diamond. Distinctive and dramatic while delicate, this easy-to-wear design supports a center diamond framed by a floating bezel yet visible through the open gallery.14 small full-cut diamonds are thread-set in the support for the bezel, a perfect complement within the rising band add style and shimmer. A delicate, timeless style with filigreed scrollwork framing a prong-set center diamond and channel-set melee diamonds that accentuate the brilliance of the 1/3ct. to1 ct. carat center diamond. This is an exceptional choice for a smaller hand, with incised scrolling adding classic, graceful simplicity that’s satin-finished on the sides with a prong-set one-third carat diamond. A playful setting with 5 bezel-set diamonds of approximately a half carat total weight in a sweep that symbolizes our movement and growth through life. An elegant setting that’s dramatic while elegantly simple, durable and easy wear. The ring shank sweeps up in strong, graceful arcs to embrace a crowning diamond or colored gem of up to two carats in weight. 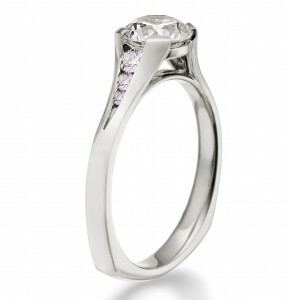 This graceful, fresh, and easy design focuses on a center diamond with twelve bright-set side diamonds . . . a perfect complement to one of our forged wedding bands. A pair of breaking waves of gold or platinum embrace and frame a brilliant diamond on this dramatic engagement/wedding ring. The Fuchsia can accommodate a center diamond of three-quarter carat weight or larger. Our clean and crisp version of a traditional classic look suspends a one-half to one+ carat solitaire diamond. Gemata’s potential is beautifully completed with a channel-set wedding band. A sculptural statement, the solitaire diamond is gracefully elevated in a classically understated form, a ring that works for diamonds up to 1.5 carat. Fitting with either a diamond, ruby or sapphire center gem and framed by brilliant diamonds, this three-stone ring that will be cherished for lifetimes. From 1/2ct. ~ 3ct. center. Fluid undulations of this ring embrace the three diamonds, portraying the dynamic nature of life in balance. From 1/3 ct. to 2 carats. Appearing to have emerged from a seedpod, the Oraria engagement ring nestles the center and side diamonds as though they are growing together. Low profile, elegant and entirely distinctive, this ring will bring lasting pleasure. Fitting for stone from ½ ct to 2+ ct.
Much like its sister Oraria, the Orion is a similar heart-beat of the magic of nature in a ring. Fitting for 1/3 ct to 2+ center diamonds and proportionate flanking diamonds. Our ocean-influenced creation with waves of channel-set diamonds gracefully rising to the center stone. 1/3 to 1+ ct diamonds. A distinctive willow weave pattern, a statement of grace and a style you will treasure forever. The low profile makes this ring perfect for gloves or overall ease… the perfect ring for an active woman.